This year’s 2018 Miami International Boat Show, the “Super Bowl” of marine industry events, is off to an incredible start! With over 100,000 people due to attend this week, this is the marine industry’s top showcase of whats to come for the new season. Hardin Marine was but one of over 70 contestants being looked at for the innovation of a new product award, and their patented swivel outboard rigging connector stole the show for innovative problem solving. The non-corrosive connector reduces undue cowling and transom stresses by providing a 24 degree of total deflection for the connected hose. 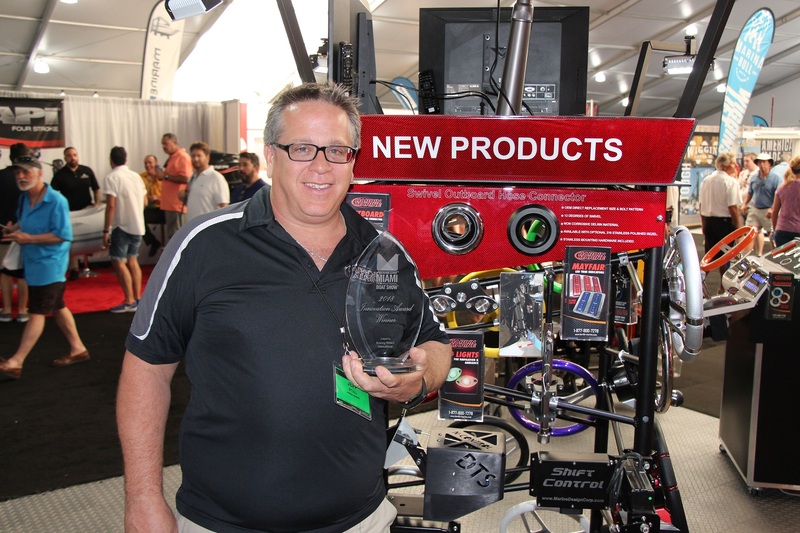 After a grueling design process product design manager Jeff Stull was happy to show off product and the award for us but mentioned it was a team effort from all the staff at Hardin who were able to focus customer needs into a functioning product. Congrats to the Hardin Team for being honored with such a great new innovation.